When the novel begins Sarah's best friend is delivering the baby of her husband's girlfriend. The best friend dies right after the birth, and Sarah and her husband are left to raise the baby that they named Jefferson Bridge. Life in rural South Carolina in the early 1950s is tough and there is often no food to eat in the house - especially after her husband loses his job and uses what little money they have to buy alcohol. He dies very early in the story and Sarah is left to raise Jefferson Bridge but there is a big problem with that - her mama told her at an early age "You ain't got one good mama bone in you, girl." With these words ringing in her head since the age of six, Sarah doesn't believe that she has the capacity to love Jefferson Bridge like a mama should. That is just a brief synopsis of the book but the real story is whether Sarah can love her husband's son like her own, build a relationship with him and be a real mother. She first has to learn to gain trust in herself and her abilities before she can create a family. She has to overcome the words that her mother said to her so many years ago and find her own 'mama bone' to be a mother to a boy who is not biologically her son. 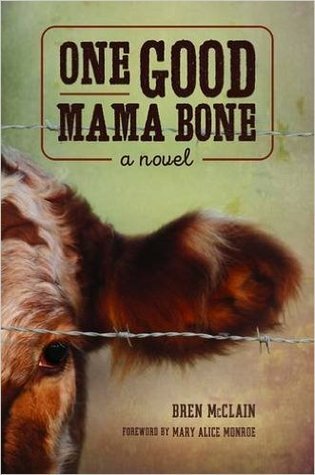 This novel is beautifully written and so descriptive of life in the rural South. The hardscrabble life that the characters are living is apparent on every page - no food to eat, no money in the bank, no wood for the fire or gas for the car. But by the end, the reader realizes that it's not the material things that really matter in life, it's love and family that are the most important things in life.